Do you accept private insurance? We do not accept private insurance; however we are able to create an invoice for you to submit to your insurance company for possible reimbursement. Speech and language therapy may be indicated for children whose communication skills (speech and/or language) are considered to be behind those of peers. A child who is unable to clearly articulate, express him or herself appropriately or who has difficulty understanding spoken and/or written language may benefit from therapy. In addition, speech and language therapy can address difficulties with social communication. Your child may be referred to an Occupational Therapist if he/she is having difficulty fully participating in his/her daily life related to school, play and self-care. An Occupational Therapist will always ask the question: "is there something affecting your child's ability to participate in age appropriate activities?" The OT is specifically trained to breakdown activities and identify in what area a delay is present. Your child may be referred to a Physical Therapist if he/she is late in achieving motor milestones, or if your child is consistently walking on tip toes. Another example of a gross motor delay may be that your child appears to be clumsy, have a low endurance, or even difficulty climbing stairs. All of our evaluations begin with a parent interview during which we ask questions about your child and his/her developmental history. The clinician(s) will then administer the appropriate standardized testing for your child. Together with the information gathered from the parent interview, testing scores, clinical observation and teacher report (if applicable) will be considered when creating goals specific to your child's needs. Following the evaluation process a meeting will be scheduled with you to discuss the results and recommendations. The duration of each treatment session is determined by your child's individual needs. Sessions can last anywhere from 30 minutes to an hour. Your child may attend therapy more than once a week, again, depending on his or her specific needs. Can my child be seen by two different therapists in the same day? If your child could benefit from more than one service (i.e., speech therapy and physical therapy) we will do our best to schedule your child in back-to-back sessions. 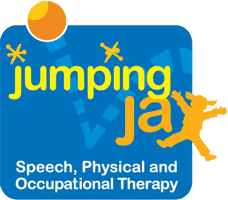 At Jumping Jax, our number one goal is discharge. We will work with your child so that he/she will achieve goals in an appropriate manner.